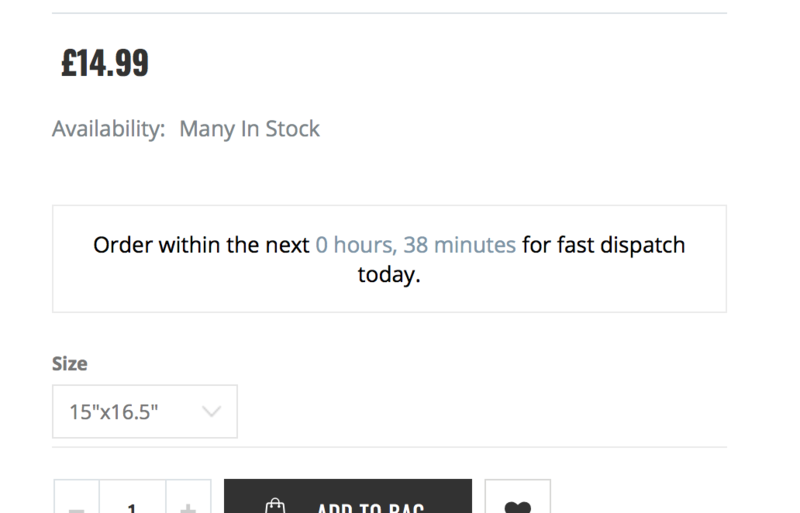 Delivery Timer allows you to show a handy timer on your product pages. This is a great way to create urgency and increase conversions. It is also helpful to customers who seek this information and may otherwise not purchase without it. How much does Delivery Timer cost? I have installed Delivery Timer, what next? I have setup Delivery Timer correctly but it isn't displaying? Delivery Timer is showing but not where I want it? How do I style Delivery Timer? I want to display the timer on some products but not all? Delivery Timer costs just $7.99 a month. With the increase in conversions and sales from motivating potential customers to purchase, it will more than likely pay for itself in no time. Now it’s just a case of setting it up. To enable or disable the widget at any time, use the following section. Remember to click “Save Configuration” after making any changes. The above will determine if Delivery Timer is active but not necessarily if it displays on the frontend. The following settings are up to you. Common settings are to have “Weekdays” enabled with Saturdays and Sundays disabled. Next is a section for estimated delivery dates. We will skip over this for now and cover it under a separate tab. The default message is good for our example so we will leave it for now. We will style with a simple border and save the configuration. Delivery Timer is designed to work with most themes out of the box. If you have checked settings and it should be showing but isn’t, you may have a custom theme. Remember: Always make a backup of your theme’s file you are editing before making changes to a live store. If you aren’t comfortable and would like assistance, simply send us a message and we will help you. By default, the timer will show on all products as that is what most merchants want. If the products you want to hide the timer for are not currently in a convenient collection, simply create a new collection in Shopify, add the products to it and come back to Delivery Timer to select the collection you just created. No fear! We are here to help. Simply drop us a message and we will help you asap.